Home Networking - Wi-Fi and Ethernet through Power Outlets Creating an entire home network has never been easier with IOGEAR's Powerline Wireless Extender Kit. Powerline networking technology allows you to avoid the hassle of running Ethernet cables throughout your house or apartment by taking advantage of the electrical wiring that already exists within your home. Turn your home into a high-speed data network for your broadband devices. Little Package - Big Results Measuring a mere .98" (25mm) thick, 1.85" (47mm) wide and 2.56" (65mm) tall, the included Powerline Nano Ethernet Adapter is some of the smallest Powerline adapters available on the market and has been designed to be discreet. The adapter also features a matte finish that can be painted over to easily blend into your home d�cor. The Nano sized form factor allows for easy access to other power outlets. Hybrid Network Connectivity - The best of both worlds in a single package Getting fast and reliable Internet coverage to every corner of your home can be difficult, even when using the latest Wi-Fi technology. IOGEAR's Powerline Wireless Extender Kit is designed to help eliminate these troublesome Wi-Fi dead spots by allowing you the freedom to create a Wi-Fi network anywhere in your home - all by simply plugging in our Powerline Wireless Extender into an available power outlet. As an added benefit, our Powerline Wireless Extender also has a built-in Ethernet port to connect any non-wireless networking device to your Powerline network, granting you the flexibility to customize your home's network to fit the needs of your Ethernet and Wi-Fi based devices. The Power of High-Speed Ethernet and Wi-Fi Make sure you get the most out of your broadband Internet with IOGEAR's Powerline Wireless Extender Kit. With transfer rates of up 200Mbps for wired connections and 150Mbps for wireless, IOGEAR's Powerline adapters provide enough bandwidth to take advantage of your ISP's premier grade network speeds. Easily distribute high-speed wired and wireless data connections to all of your broadband based devices through almost any power outlet in your home. Our high-speed Ethernet adapters are the perfect solution for streaming HD content on devices such as Roku™, Apple™ TV, Slingbox™ and Smart TVs, online multi-player battles on your gaming console and video chatting with family and friends across the globe with fast and easy setup. 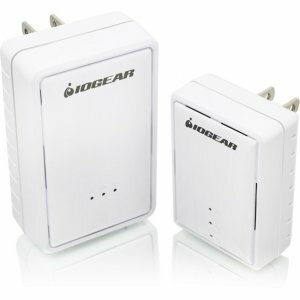 Extend your Network up to 300m (984ft) away IOGEAR's Powerline Wireless Extender Kit enables you to extend access to a high-speed wired or Wi-Fi network to nearly any room in your home and garage. Simply plug in the Powerline Nano Ethernet adapter into an available power outlet near your router or modem and connect via Ethernet cable (CAT5/CAT5e/CAT6). Then plug the Powerline Wireless extender into an outlet in an area of your home where Wi-Fi signals are weak or unable to reach. By tapping into the electrical wiring that's found throughout your home, you are able to effortlessly extend your home's wired and Wi-Fi networks up to 300m (984ft) without any additional cabling! Simple and Secure Networking Take the challenge and frustration out of setting up a secured home network with the simple press of a button. IOGEAR's Powerline adapters use 128-bit AES encryption, ensuring that your network is secure and your valuable data is protected. The Wireless extender also supports WEP, WPA, WPA2 wireless security protocols, preventing your Wi-Fi network from unwanted outside connections.